Home > Diagnosing an Allergy > Where Can I Have a Gluten Test Done? Gluten allergies can cause serve discomfort and in some cases can result in serious illness. Indeed in some very severe cases the sufferer could go on to suffer from bowel cancer. Therefore it is vital that anyone with a gluten allergy discovers this early on. Once the allergy is detected the sufferer can make the adequate adjustments to his or her diet in order to prevent the symptoms and side effects. This means it is extremely important that the sufferer is tested for the allergy as early as possible. The symptoms for gluten allergies vary greatly. Sufferers may experience bloating and bowel problems, headache, fatigue, weight loss and depression. The severity of the symptoms vary from person to person. If you think you may be suffering from a gluten allergy then you must visit your doctor and request a test. Explain your symptoms and ask to be tested for a gluten allergy. The first test given to you will be a blood test. This test examines the antibodies in your body. By looking at these the doctor is able to determine whether or not you are suffering from a gluten allergy. The blood test can often be done at the doctor’s surgery with the blood samples sent to hospital laboratories for testing. In some cases your doctor may send you to hospital to have your blood taken. If the blood test reveal that the patient has a gluten intolerance the doctor may decide that the patient should undergo a biopsy. A biopsy is a small operation during which a sample of the bowel is removed in order for the doctors to determine what damage the gluten allergy has caused. This procedure must take place at the hospital. The operation takes a short time and the patient should not be in too much discomfort afterwards so if you have been told you should have a biopsy do not worry. What If My Doctor Won’t Give Me A Test? 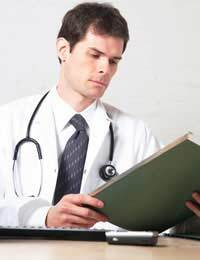 If your doctor refuses to give you a gluten allergy test you should seek a second opinion. Unfortunately in some cases doctors may not listen to the needs of their patients. Explain your symptoms clearly and ask why you are not being forward for a test. If your doctor does not give a valid explanation then it may be time to change doctor or at least speak to another doctor to get their opinion. It may be possible to be tested at an allergy testing clinic. These clinics often offer blood tests to determine what allergies you may have – including all food allergies, not just gluten. However you will have to pay for these tests and should you have to go further with treatment you will have to go back to your doctor or hospital therefore for cost reasons and for smoother progress going forward it is best to get the test done at your GP's surgery or hospital if possible. Until you are tested and receive your results you should continue to consume gluten products.